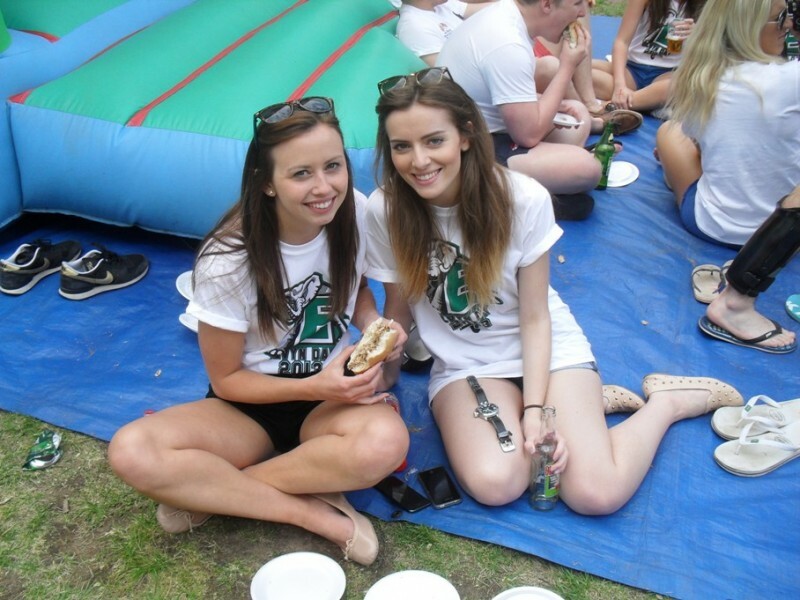 If you’re planning your next social event in Market Bosworth, Hinckley or other areas within Leicestershire, why not consider our mouth-watering hog roast catering service? Here at The Roasting Pig we offer a wide range of both set-menus and bespoke packages, which are perfect for weddings, birthday parties, corporate events, or any other type of gathering. 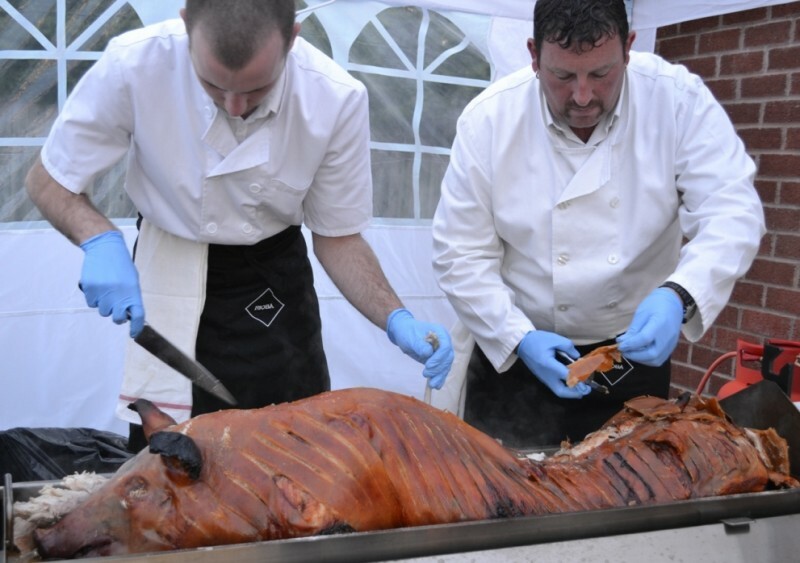 We’re ideally situated for hog roast catering in Market Bosworth and throughout the surrounding areas such as Barlestone, Twycross, Newbold Verdon, Desford and Stoke Golding. You can be sure of a professional and expert service thanks to the glowing testimonials and positive feedback received from our extensive customer base. 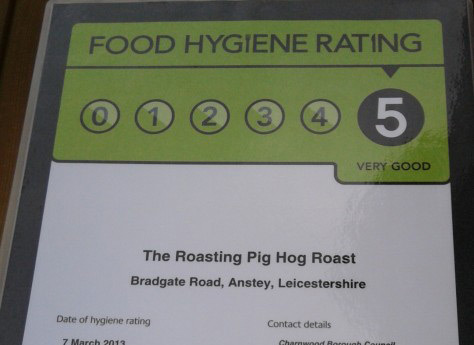 We pride ourselves on offering mouth-watering menus at a competitive price, while our five star hygiene rating speaks for itself. 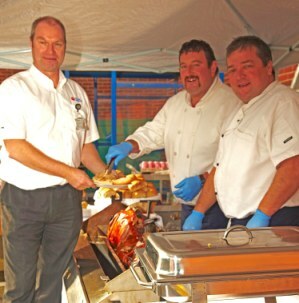 Throughout your hog roast in Leicestershire, our fully-uniformed chefs will be on hand to prepare and cook your choice of locally-sourced meats, and serve your guests with a smile. As well as a range of fresh pork, beef, gammon, chicken and turkey, we also offer vegetarian options, as well as catering to any other dietary requirements you wish to request. You can enjoy the satisfying spread of a full buffet with bread rolls, stuffing and sauces, as well as napkins and cutlery provided too. We can also deliver and collect the hog roast equipment on its own, giving you the chance to step us as head chef for the day. Our self-catering option is perfect for anyone looking to have a go at hog roasting themselves, as our hog roast hire service comes complete with a full demonstration. You can choose to hire the roasting oven and gas supply on its own, or why not go the whole hog, and order one of our impressive 50kg hogs to cook yourself? As with our service package, you can also request whatever sides and sundries you require, to complete the perfect party. If you have any further questions, or you’d like to discuss your needs further and obtain a quote, please don’t hesitate to call our friendly staff on 0116 212 5259.